Splatball is the Twin Cities premier MN paintball store and repair shop located in Minneapolis, Minnesota! Splatball is Minneapolis’s largest full service paintball store in MN with over 50 years of combined experience. Our employees have been factory certified/ trained to work on hundreds of different paintball markers. Due to our outstanding service history, Dye Paintball has even made us their only Master Service Center in Minnesota. We know paintball. 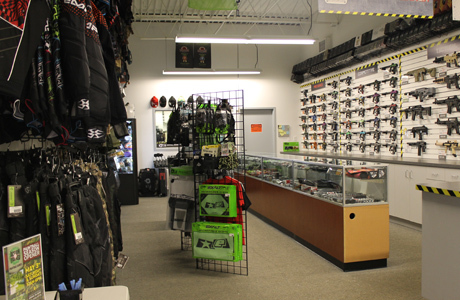 As one of the oldest paintball stores in the Twin Cities, you won’t find a more knowledgeable staff. We install upgrades, repair guns and clean equipment. Whether it’s a classic paintball gun that you need an o-ring for, or you’re looking for the latest Dye paintball gear, we have the inventory and the experience to provide you the best value for your money. Splatball has a growing selection of both new and used gear weekly. Curious what we have in stock? Check our EBAY store above or our Used Gun Page. Want to sell some old gear? Splatball buys, sells and trades all paintball gear! Stop in today to check out all of our latest and greatest merchandise and don’t forget to take a look at the used gun selection!